Sometimes guests may need a little bit extra help with the things many of us take for granted. 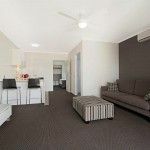 With our wheelchair accessible apartments at the Cooroy luxury motel, we have given careful consideration to those guests that are not as mobile as the majority of the community. Our wheelchair accessible apartment has been designed with no steps from the carpark into the unit and complies with all the stringent requirements required when providing wheelchair accessible accommodation. 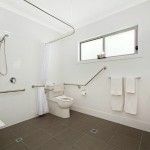 With the latest Australian Standards being met regarding circulation spaces in bathrooms, doorways and around beds in our contemporary designed apartments with brand new fixtures and fittings makes our accessible apartments perfect for the travellers needing these types of facilities. 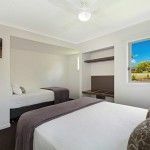 Ring us today to make your booking, we’d love to accommodate your needs in our Cooroy wheelchair accessible accommodation on the Sunshine Coast at the Cooroy Noosa luxury motel.